“Melting Lingotto (While an artist is labouring at his work of art, nothing prevents it from surpassing Dream. As soon as it is finished, the work must be hidden or destroyed, or better still, thrown as a prey to the brutal crowd which will magnify it by killing it with its scorn, and thereby intensify its absurd uselessness. We thus condemn art as finished work, we conceive of it only in its movement, in the state of effort and draft. Art is simply a possibility for absolute conquest. For the artist, to complete is to die. 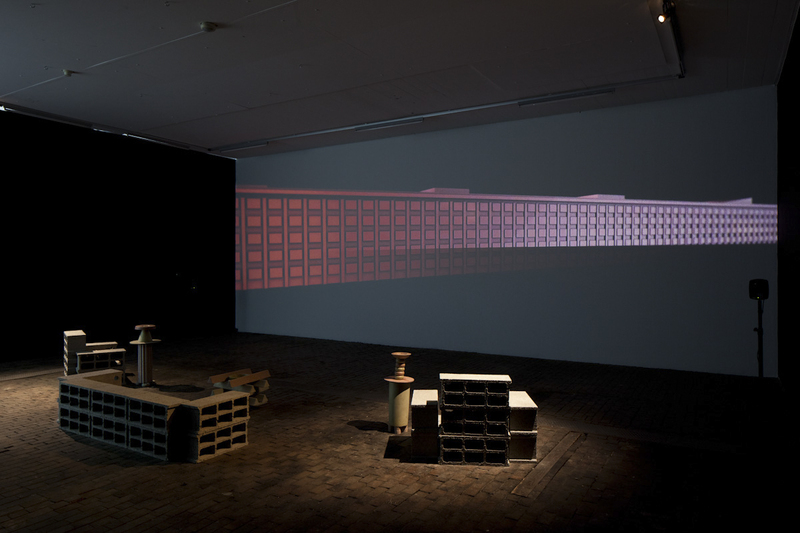 Marinetti, Futurism Manifesto)”, video installation with a 4:15 loop 3D animation, a 5.1 sound piece, concrete blocks, hand cast tinted concrete forms, chocolate candies printed of Antonio Sant’Elia’s portrait, variable dimension, 2014. This video represents the Lingotto, former FIAT factory in Torino, famous futuristic building with its one-of-a-kind racing track on the roof, made out of chocolate and melting graduately. Melting Lingotto come from an imaginary fusion between Antonio Sant’ Elia, creator of the manifesto for futuristic architecture in 1914, who imagined hundreds of factorie-palaces, died before teh age of 30 in the war and had never built and Willy Wonka, romantic character imagined by Roal Dahl in the 60s, chocolate maker with an uncontrollable imagination. Inspired by the speed of machines, the purity of rough materials, the sweetness of the chocolate and the utopian and eccentric creativity. Exhibition view at Centre d’Art Contemporain, Geneva. Stills from Melting Lingotto, 3D animation, 4:15, 2014.